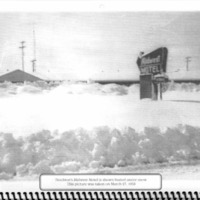 Stockton's Midwest Motel is shown buried under snow. This picture was taken on March 27, 1958. “Blizzard,” Recollections Kansas, accessed April 21, 2019, http://recollectionsks.org/items/show/1798.